The latest episode of Boruto: Naruto Next Generations examined the new status quo after the action-packed and emotional ending to the long-running "Mitsuki Disappearance Arc". The fallout of that arc had to be examined on many fronts - from what Mitsuki's fate in Hidden Leaf will be, to what kind of punishment Boruto and Sarada would suffer for desertion, and the larger question of who (or what) set the wheels in motion that first gave Onoki the knowledge to create his Fabrications. In the midst of all that tying up of loose ends, and stage-setting for the next chapter, it was almost a minor footnote that Boruto lost one of the major powers that he gained during the "Mistsuki Arc": namely, his ability to summon Garaga, the giant snake! "I came to say goodbye... Our summoning contract is over. That was our agreement in the first place, right?" "Huh? You're not scared, are you? Quit making excuses and just go settle it once and for all, brat!" "If you already know that you don't need me anymore, right?... Guess there are people foolish enough to trust a friend till the end..."
It made sound as though Garaga is talking tough, but in his own gruff, contentious way, he actually delivers something of a genuine fond farewell to Bourto, telling the young genin to "Take care of yourself!" Boruto wishes Garaga well, while also admitting that he owes the giant serpent for his service. 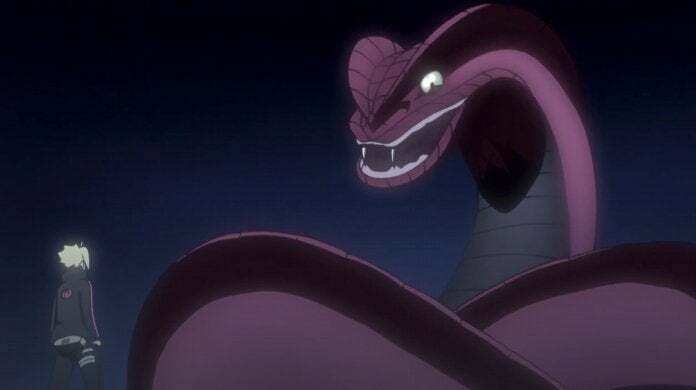 While Garaga was one of many things in the "Mitsuki Arc" that ultimately fell through the cracks in terms of attention and focus, the giant serpent definitely got a chance to shine during Boruto and Sarada's battle with a giant Akuta monster created by the Fabrication Kirara. It was a pretty standout action moment, so it will be sad to see Boruto lose such a powerful summon - especially one that results in a character as entertaining as Garaga. Boruto: Naruto Next Generations streams weekly on Funimation, Crunchy Roll and Hulu.